Manufacturer & Trader of Exhaust Hood. Our product range also comprises of Barbeque Grill, Refrigeration Equipment and Cooking Equipment. To meet the diversified requirements of our prestigious clients, we are engaged in offering Exhaust Hood. This hood is developed using quality material and higher technologies. Our professionals opt for strict quality tests throughout the production of the hood to guarantee optimum performance. The provided hood is made accessible in different capacities. Provided hood is built for heavy operations. Besides, clients can get the hood from us at industry leading rates. 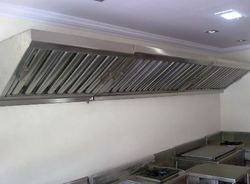 Looking for Exhaust Hood ?